I didn’t know what to expect for my first research cruise, which entailed an excursion to core sediment along South Eastern Greenland. I only knew that we sought regional connections between arctic sea-ice melt and Greenland Ice Sheet retreat. Little did I know, the process for researching the earth system’s climate was just as much a system in itself, with forcing (cause) and response (effect), like greenhouse gases warming up the atmosphere. Or in the context of my research, sea ice melting and exposing ocean heat to the Greenland Ice Sheet. There are so many factors that affect research and fieldwork. From the start, the cruise confirmed my belief that the only way to survive in outdoor scientific fieldwork is to leave room for general uncertainty; No matter how much planning and leadership exists, you must expect non-scientific problems, weather changes, instrument failures, and either human error or handicaps. We can neither plan nor anticipate external forcings that drive fieldwork, like timing, frequency, and intensity. In ‘The non-science side of a research cruise,’ Chata Seguro, shares an extreme perspective on research cruise misfortunes. In contrast, I aim to get your feet wet with the expected to slightly unexpected ‘hiccups’ of fieldwork. I also juxtapose some daily routines and comforts that keep us ‘in orbit’. Let’s start with the cruise departure. Just when you think you know the plan, you’re missing one critical piece of information. You feel like you’re starring in an action film, one of a few, privy to an undisclosed ship location. The ambiguous address turns a drive into an ‘I spy’ game, in which you must spot the correct vessel. When you finally do, you approach an entrance gate and declare your arrival into a security buzzer. The guard on the other end quickly mumbles and opens iron gates just enough to admit your vehicle. On the other side, you navigate a multicolor maze of shipping containers. As soon as you reach the boat, you must hastily grab your bags and bolt. It is not advisable to stand and take photographs for any extended period of time. If you do, the guards will come after you. So, you’ve arrived at your destination, but it is still unclear when the boat is leaving. An internet company may cause delays, due to issues extending the on-board service. The boat company could still be waiting to receive clearance for international waters on the day you are supposed to leave. Patience and flexibility are critical in these situations. The boat sets sail and now the day and night shifts begin. It increasingly seems like the navy: short showers, a rigid schedule, and a full body suit. With teamwork and physical strength, we cut, split, and pack the cores. On lab-cleaning day, us lab-rats transform into 10 Cinderellas, scrubbing the floors. When we remove our work clothes, the boat is like a hotel with access to a gym, sauna, massage chair, movie library, full wardrobe closets in the cabins, screen TVs, frequently replaced bed linens and some good ol’-fashioned Internet. Food doesn’t fall short to these comforts; the chef arranges massive platters of surf n’ turf, vegetables, cheeses, and fruit. At teatime, he bakes tasty treats. Though the cooks prepare three basic meals at ‘normal times,’ your eating time and preferences synchronize more with when you are awake and how much energy you need, since your body clock quickly muddles. Time is in a different dimension, as if your life on land has paused and will resume upon return. You miraculously catch up on numerous movies and books. Once you get bored of that, you can join the never-ending card games or you may be lucky enough to participate in Norwegian style bingo and trivia quiz nights. It simply doesn’t end. You lose your sense of days. With daily naps, one day multiplies into two. 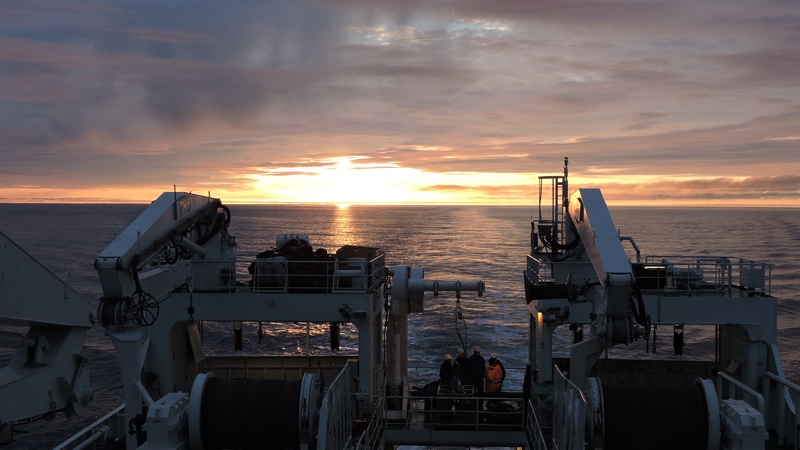 In the Arctic’s midnight sun, you must simulate nighttime by shutting your porthole tight. The time on board doesn’t even correspond to its proximal time zone, but rather Norwegian time. But, all you need to know is that within the 24-hour clock, your work shift determines everything else. You eat at time a when the cooks announce mealtime, sleep at time b, work at time c, and rest at time d.
Although there is a coring work schedule set in place, there are greater forcings that truly affect what we accomplish. The degree to which you can stick to the shift depends on many factors: one being the weather. For climate scientists, weather is not only a conversation starter, but critical for the execution of fieldwork. If the seas are too rough, the coring gets tricky. If the fog is too thick, it could indicate patches of sea ice. To plan for these variable conditions, one of our principal investigators hosts an update meeting in our ship’s auditorium, during which he presents current weather data: temperature, pressure, wind speed, and wind direction, as well as sea ice conditions and drift. Drifting sea ice is actually a problem for a ship that doesn’t break ice, and therefore hinders our ability to core sediment along our planned transects, from the shallow shelf to the deep waters. The greater question in Ice2Ice is precisely ‘What happens if sea ice disappears?’. Well, as someone simply said: “then we would get to core”. It is as much a joke as it is a reality. Who would have thought that sea ice would get in the way of studying sea ice? Aside from these weather factors, the quality of the sediment layers (stratigraphy) equally affects our work schedule. In choosing a coring site, we scope out the sediment through seismic sensors and identify spots with deep penetration potential. Although there are pre-mapped coring sites, it still requires proper surveying. Our equipment cannot penetrate through any areas with hard bedrock, hard-compressed sediment, and glacial fragments. Other factors can delay your work completely or put you out of work: instrument failure that requires you to be in a standstill for days, personal hunger, absolute seasickness, and more positively, extra efficiency of the opposite shift. Ashley is currently a Fulbright Scholar in the U.S. - Norway Student Fulbright Program with the Bjerknes Centre for Climate Research, based in Bergen, Hordaland, Norway. Her fellowship is centered around the Ice2Ice Project project, studying the effects of arctic sea ice melt on the Greenland Ice Sheet. She is a research assistant for the marine sediment team, focused on empirical data. 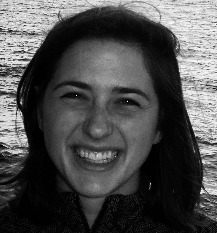 Ashley is a 2014 graduate of Bates College, where she received a Bachelor's degree in Geology and German.